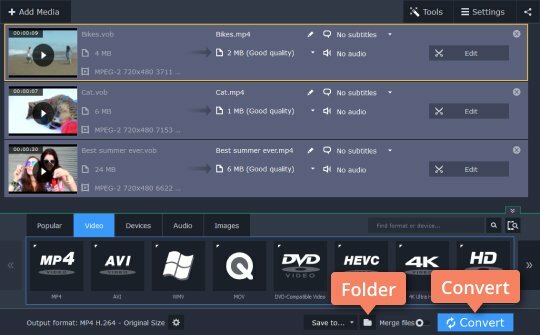 Need a DVD converter for your movies? We live in a rapidly changing world, and while DVD was a brand new technology just a few years ago, it now seems more and more old-fashioned. If you have your digital movie collection stored on DVDs or CDs that are now gathering dust on a shelf, it’s time to bring them back to life and import them to your hard drive. But how? 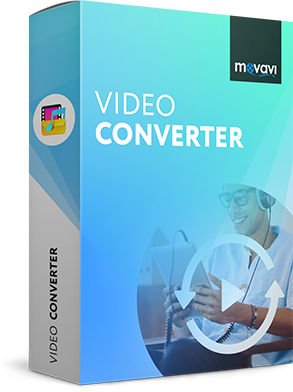 There’s nothing easier if you have Movavi Video Converter – powerful video conversion software for Windows or Mac that enables you to rip unprotected DVD movies and home video records on your AVCHD camera or another device in just a few simple steps. Just download the version you need and follow the instructions below. Download Movavi Video Converter, open the file, and install the software on your PC or Mac. Insert the disc into your computer’s DVD drive. Click Add Media > Add DVD in the top left corner of the Video Converter window and choose Open DVD. Find the disc on your computer and click Select Folder. Choose the desired format for your converted DVD video under Video. 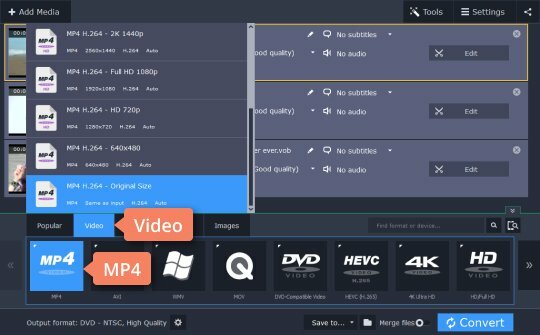 Movavi Video Converter supports over 180 formats and codecs including MP4 (MPEG-4), AVI, MPG, HD video, and more. You can also save your movie in an appropriate format for playing on the mobile device of your choice, including iPad, iPod, Android phones and tablets, and many more – just check the Devices category to see the complete list. Once you have selected the preset that suits you best, the program will estimate the size of the output video file so you can decide if it meets your quality and other requirements, or you can choose another format. Check the Save to field and, if necessary, change the destination folder for the output file by clicking the Folder icon. Then, click the Convert button in the bottom right corner and wait until the video is processed. Once the conversion is complete, the folder with your converted DVD videos will open automatically. Note that by using Movavi Video Converter, you can not only rip DVDs to video files but also convert videos to the DVD format. Check out our step-by-step tutorial on converting video to DVD.